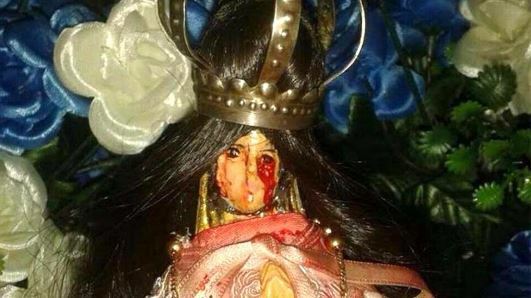 A statue of the Virgin Mary with red liquid flowing from its eye, down its face has shocked devotees in Argentina. The statue was placed in its usual place at a family chapel in Los Naranjos, Argentina, when the unusual phenomenon was noticed to the amazement of onlookers. Pictures show the Virgin Inmaculada Concepcion de Maria figure with a red stain on the left side of its face, flowing down to its robes. It has now been transferred to the local Catholic Church where more devotees can have access to it. Church officials are waiting for the statue to” weep” again so they can report it as a miracle, priest Ricardo Quiroga explained. The statue began to shed the bloody tears during lent and a number of Catholic faithful, including the priest, see it as a sign calling Catholics to a life of holiness during this solemn period. “The Virgin is asking us to change the way we live now for Lent,” Fr. Ricardo said. This will not be the first time something similar has happened. In November 2016, a video went viral of a statue of the Virgin Mary crying blood, this time in a church in Jalisco, Mexico.